Extra High concrete prefabricated buildings for light industrial use or simply to provide extra clearance for your 4WD and camper van. Our specialised division can cater for industrial and commercial applications including school and scout minibus storage, light-industrial warehousing, ambulance and fire engine storage and blocks of "battery" concrete garages. In instances where additional height is required, the Lidget Compton Highliner will provide a door clearance of up to 10ft 0in (3m) which is ample for most commercial vehicle types including minibuses. Utilising the same concrete garage panels found in our domestic range of buildings with an added rigid steel portal frame to support plastisol steel cladding to eaves and ridge. These sheets as well as the trims can be specified in varied colours to match corporate image. The roller shutter door is the choice of main door, chain operated and very often supplied with a smaller steel pedestrian doors. Doors maybe automated and skylights added to the structure. Remarkably, many buildings can be completed in just a few days. Battery garages are single or multiple blocks of buildings with a shared wall. These designs prove popular with housing and resident associations. 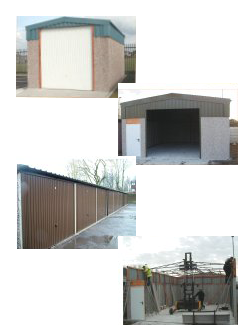 Buildings can be as varied as any of the other concrete garages within our range although forward and rearward sloping pent roof designs are the most practical. Add brick effect or brick front posts, maintenance-free PVC fascias in a choice of white, wood grain and brown finishes and security options such as extra-point locking to the main doors. We can also cater for individual or planning requirements.